Good news! This offer has been extended through 5/31/13 at 11:59 pm (PT). Treat is offering all new customers a FREE Father’s Day card today only – May 28. through 5/31/13 at 11:59 pm (PT). To get the card totally free, have it shipped to you. That also allows you to sign it and write anything you want to add in your own writing. Or, for the cost of a stamp, you can have Treat mail it directly to the recipient. And since it’s so early, they even let you choose the delivery date. That’s all there is to it. Plus did I mention that it is totally FREE!!! How can you beat that?! 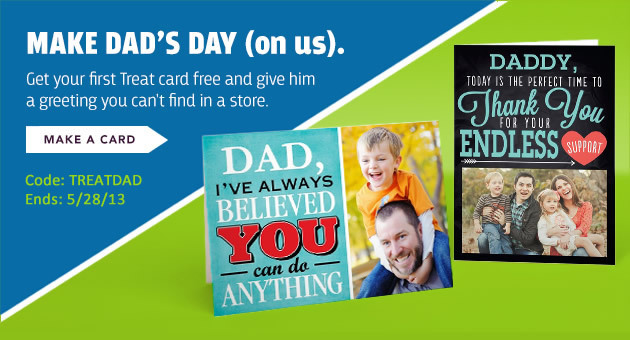 Make your FREE Father’s Day card today! Some people had trouble with the code over the weekend so they are offering another flash sale. I just wanted to give you a heads up that today at 12:00 pm (noon) Treat, the leader in personalized greeting cards is having an unbeatable 2-hour offer. Just use the code WEEKENDTREAT (from 12-2 EST) and enjoy a free, customized, card. This offer applies to all new and returning customers. This code is just in time too, as today is the LAST day to guarantee shipment before Father’s Day. While you are waiting, head on over to Treat to browse their collection of awesome personalized Father’s Day cards. You could even upload your picture and make your card so you are already when the code comes out later today. Free Personalized Father’s Day Card – Includes FREE Shipping Too! Only two more days left to grab a FREE card. This offer is good through tomorrow – June 8. Your dad will love a personalized card! Father’s Day is coming up soon, Sunday, June 17th. How about a a FREE Father’s Day card to make Dad feel special. (You don’t have to tell him you got it FREE 🙂 ) Whether you want to make him laugh with funny Father’s Day cards, share memories from throughout the years with Father’s Day photo cards, or get him to shed a tear by simply letting him know how much he means to you, Cardstore.com has all the options you need to get you started. Just use coupon code LUVDAD2 at checkout for your FREE card! Even shipping is FREE which makes this one very nice Father’s day freebie! FREE Father’s Day Cards at Cardstore.com starts 6/1! Use Code: LUVDAD2 at checkout for a limited time. Shop Now! The FREE card offer is valid in the US and Canada only but Free Shipping only available in the US. One Free Card redemption per Cardstore.com account. With Father’s Day only weeks away, everyone’s on the lookout for great gifts. One great idea is a photo book. Right now you can grab one for FREE and just pay shipping of $7.99. How is that for a bargain father’s day gift? The coupon code is valid on 7.75″ x 5.75″ hardcover pocketbook or get $20 off any hardcover photo book. Looking for a great Mother’s or Father’s Day gift? Why not consider a personalized custom stainless steel travel mug? This would be great with pictures of your kids or you could personalize them with your coupon logo. I intend to buy one with the Bargain Shopper Mom logo! Just use code TRAVEL2 at checkout which gives you $11.99 credit. This brings the price of the Travel Mug down to just $2!!! Shipping is a $5.99 which bring your total to just $7.99 shipped! This offer expires Apr. 1, 2012. Get Your Personalized Custom Stainless Steel Travel Mug Today!